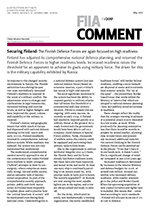 Finland has adjusted its comprehensive national defence planning, and returned the Finnish Defence Forces to higher readiness levels. Increased readiness raises the threshold for an opponent to achieve its goals using military force. The driver for this is the military capability exhibited by Russia.